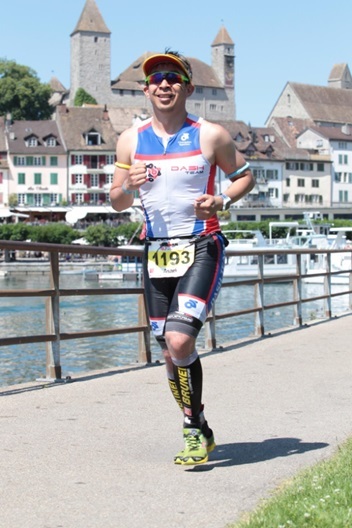 For those who are not familiar with Ironman 70.3, it is long distance triathlon consists of 1.2 mile/1.9 km swim in Lake Zurich, 56 mile/90 km cycle and finish with 13.1 mile/21 km run. 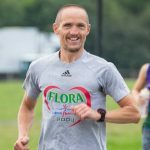 The plan at the beginning of the year had been to go under 6 hours, it’s a big if, and I had been well leading right up to the race I strongly believe I would have hit the goal. This event is part of my training for my main goal in October 2015, the full Ironman 140.6 in Barcelona. Weather was perfect except that it was 32 degrees in Rapperswil-Jona. The day was calm and almost sunny as we headed down to the lake. The pros and the young guns went off at a little bit early as the released on the swim is according to the age groupers. 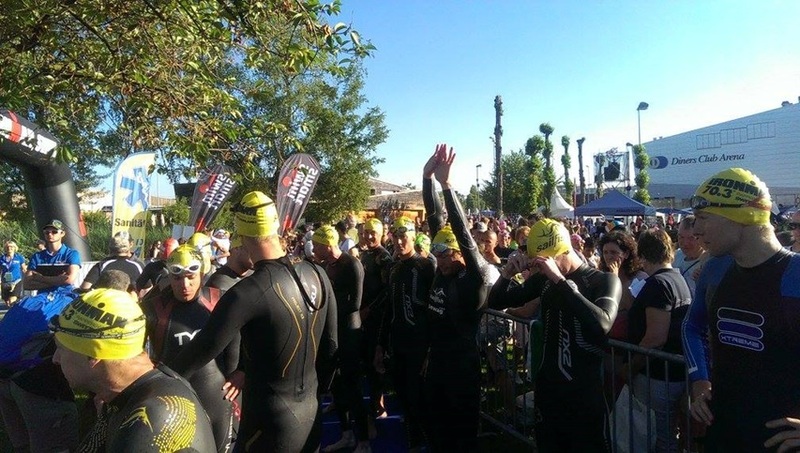 The pros starts at 7:55am and the 35+ fogies made our way into the water for 8:35am start. The line was lifted and everyone was fighting for a good position in the 17 degree cold water. Fighting for a spot I tried to find someone’s feed which was more difficult than I thought. It was extremely tough to orientate myself since all I saw was flying arms and legs. I didn’t start too fast and tried to keep a good technique. There was little biff over than a clash of hands occasionally, and I managed to narrowly avoid kick to the face, just the shoulder as we made our way around the first buoy. I didn’t pay much attention to where I was in the field but I felt as if I was slowly falling behind the main group. The remainder of the swim went well, the markers were easy to see. 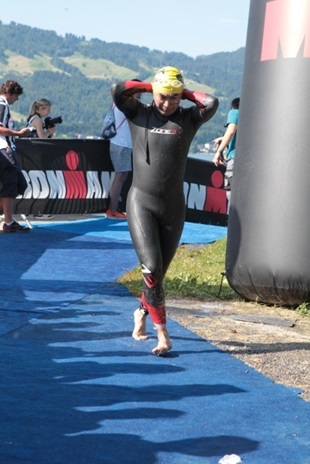 After 1.9 km swim and 54:30 minutes, I got out of the water running past a cheering crowd towards the transition area. 4min 19sec – A bit of a dizzy run into transition tent, all of us looking like wipe-out contestants! Grabbed bag, sat down and then took my time, sun screen on, hoping my senses would return. This is the time when my body is still in swimming-bike transition mode and realised how important the swim-bike brickwork which I rarely do in training. Out into the tent in the bike shoes and start running to my bike. Straight out of transition, and run the bike past people falling over at the mount line. Climb the first rise in the small ring, and then change up for the flatter section that follows. It was pretty much flat but after 10km the course took us up “The Beast”. I think that is self-explanatory. On the way up the 15% incline the people of the village created an amazing atmosphere with all sorts of tools that made noise and a Caribbean band on the top of the hill. Few pro ladies were on their 2nd loop and passed me but recognised one of them was Daniella Ryf (came 1st women – went to do 4:08:43 and 2nd in the previous World Ironman Championship Kona 2014), she took the climb with ease but I guess that’s her job…. By 20km the inclines ended and started descending. The course sent us into another small village where we had to take a very sharp left turn and back doing the 2nd loop. Again those climbs became like treacle as I ground my way up them for the 2nd time with plenty of people choosing to walk them, and me swearing my way up! All together the two loops on the bike took me 03:24:00 hours which was not a great time for me. With a total of 1100m ascent, that was the toughest, hilliest bike ride ever in my life. 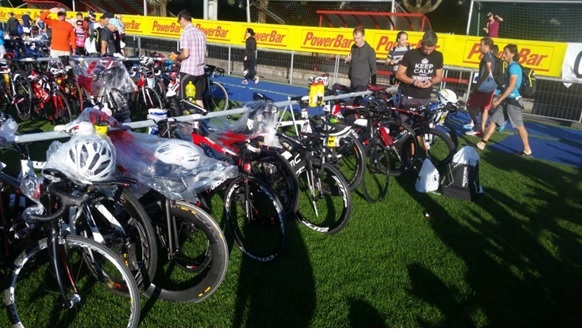 3mins 46sec – This transition went smoother, dropped the bike, grabbed the red bag, hydrated myself, took few gels in, need for a wee, been busting since the end of the first bike loop, can’t wait any longer and started the half marathon. My race beforehand was to aim at 5.41min/km pace to do at least sub 2 hours half marathon. The first few steps felt horrible and not even close to what I expected. The bike leg destroyed my run completely. I took in some more fluids to replenish my minerals and after the first 2km I felt much better. The run course were pretty much flat all around. At km 3 the loop had integrated 64 stairs called “stairway to heaven” which was the cause for many cramps that day. I had to slow down my pace and cannot go quicker because of the cramping quads. I finished the run after 2:17:50 hours. People cheered for me at every possible corner during the race screamed and yelled when I finished. With a time of 6:45:05 hours, I finished 1801 out of 3000+ participants. 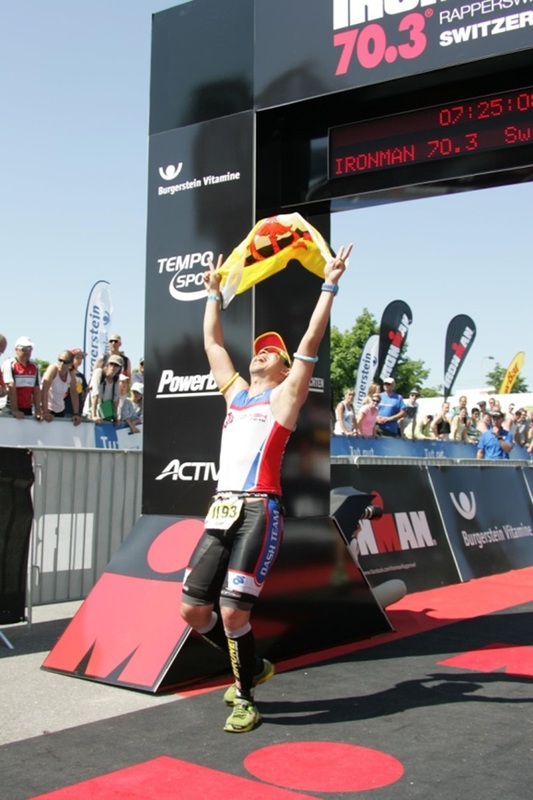 The winner of Pro Men and Women Ironman Switzerland 70.3 were Ruedi Wild and Daneila Ryf – both from Switzerland – of finishing time 3:51:27 and 4:08:43 hours respectively. Great stuff! Hardest bit but be starting each leg, already tired! Well done Bam. Can’t imagine doing all that before a half marathon! Great report.